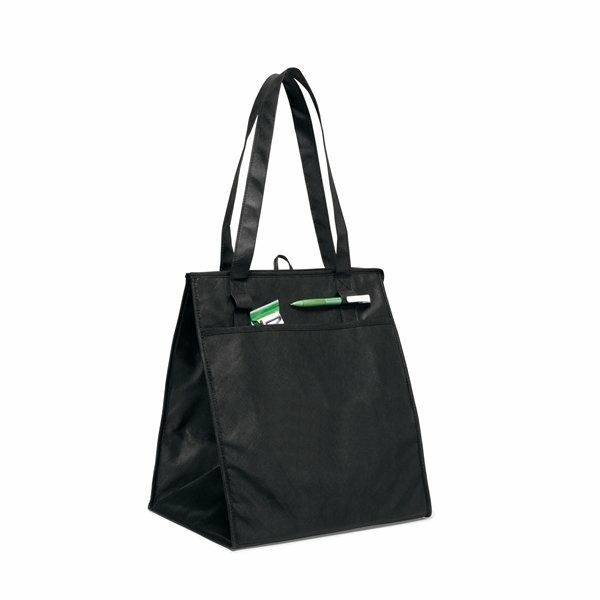 Large, reusable insulated tote for keeping your perishables cold. Large main compartment with zippered closure and generous gusset for maximum capacity. Large front pocket for storing additional items. Pen loops (pen not included). 26" shoulder straps and removable floor board. Reduced pricing on 2nd imprint color for screenprinting. the crowd LOVED the item. We bought 1000 of them and gave all of them out! Wish we had more color options to choose from. It had been simple to perform the search and select the colors and also the graphics that we had to choose were easy. the quality is remarkable. Alicia went onto our website to use the same font from our logo on the tees. She initiated this and I was very impressed with her attention to detail. the size was just right and the quality was good. Colors are bright and eye catching. tHe quality of product and how quickly it shipped were fantastic! the quality is great and will last a long time. I highly recommend this product! !